Focused on industry research and analysis, Ahain Group’s insights provide businesses with comprehensive reports on the latest trends in social business across a variety of markets and industry categories. Detailing market-leading best practices alongside an exhaustive analysis of what’s working and why our reports allow readers to get a more in-depth and all-inclusive appreciation of what social business is and how it can work for them. 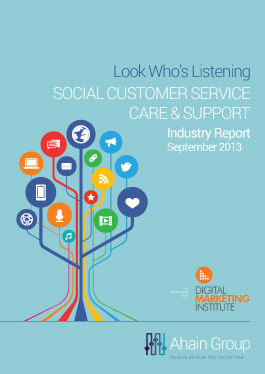 Eileen worked with Ahain Group to research and compile their latest Industry Report on Social Customer Service, Care & Support. Download it from the Ahain Group website here.